Aurum Coffee was established in 2007 and first opened it’s doors on November 27 of that year. In those early years Aurum Coffee thrived and was renowned for it’s great tasting coffee, wining awards in 2007 – Bronze Espresso blend, Silver for organic and then Silver for Plunger Filter in 2010. 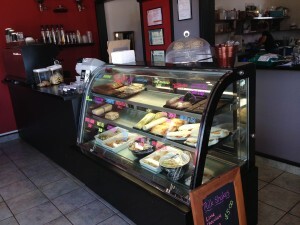 Then the owners ran into financial trouble and by early 2011 Aurum Coffee had closed it doors. It was April of 2011 and Chel Adams decided to stop by Aurum Coffee for a quick fix before a job interview when she discovered the doors closed for good. After some discussion with her husband it was decided Aurum Coffee was too good to lose and the business was purchased and re-opened under the established Aurum Brand. Chel who has a background in design started re-establishing connections and initial orders meant they were roasting 250 kilos a month all distributed locally. By 2012 the business had grown and they were roasting a ton of coffee beans a month and distributing them as far away as Australia. Aurum Coffee Roasters have recently revamped their shop with new signage, shelving and a totally new look. “We now stock a huge range of quality teas including Tiger, Madura and Ahmad to compliment our coffee variety’s. You can also TXT to Go and get your coffee on the run, so get on down and check out the changes, then grab a cup of the good stuff for yourself”. If you don’t get a chance to stop by the shop during the week you can find the best Aurum Coffee at the farmers Market every Sunday 8.00-12.30pm. We love good coffee and love to chat with coffee enthusiasts. Feel free to get in touch.